Juvéderm dermal filler was developed using a proprietary, technologically advanced manufacturing process that results in a malleable smooth gel. This malleability allows easy flow into the skin, creating a smooth, natural look and feel. Juvéderm dermal filler offers a high level of control for individualized, tailored facial contouring and for achieving a smooth and natural look. At 24 weeks, 96 percent of nasolabial folds treated with Juvederm had maintained clinically significant correction, and 81 percent maintained the correction for 1 year or more. Results were similar for those subjects with follow-up through 48 weeks after repeated treatment. The median volume required for repeated treatment with Juvederm was significantly less than that for initial treatment (0.7 ml versus 1.6 ml). -Provides instant and long-lasting wrinkle correction with built-in numbing of lidocaine. It is an FDA approved cosmetic dermal filler designed to restore volume and fullness to skin. The Restylane multi-use product line is used for fine to moderate to severe facial wrinkles and folds of all types, from the fine lines around the lips to deep nasolabial folds. 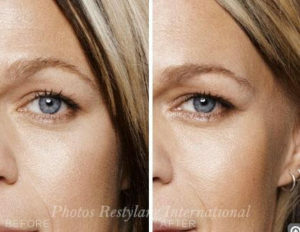 Restylane’s sister filler, Perlane (now Restylane Lyft), acts as more of a mid-level dermal filler. Hyaluronic acid is a natural substance that is found throughout your body. It gives volume to the skin, lubricates the joints and gives the eyes their shape. The hyaluronic acid in Restylane is stabilized for a long duration and is not of animal or human origin. Restylane and Perlane consist of stabilized hyaluronic acid and a sodium chloride solution with a pH of 7. All Restylane products are clear, transparent and viscous gels. The only difference between the products is the size of the gel particles. Larger particle formulations such as Perlane are used for deeper folds and augmentation. In contrast to other similar products, the hyaluronic acid in Restylane is not produced from animals. This means that there is no risk of disease being transmitted or allergic reactions being elicited if you are sensitive to common foods, such as beef, chicken and eggs. How long will a treatment session take? Most people find the injections relatively painless. The Restylane products come with a built in numbing component (Lidocaine). There may be a very few ‘ouch” points, but most patients are surprised as the lack of pain. Here at Cosmetic laser Professionals we use a Lidocaine base Anesthetic cream topically first before any procedure. Immediately after the treatment, you can expect slight redness, swelling, tenderness or an itching sensation in the treated area. This is a normal result of the injection. The discomfort is temporary and generally disappears in a few days. After a lip treatment, the lips may become swollen and look somewhat uneven. This can persist for a few days (up to a week). If the discomfort continues, please contact your physician or practitioner. Are there precautions after my treatment with Restylane? Yes. During the first 48 hours after your treatment, do not massage or rub the treated area. If you have had a lip enhancement, avoid puckering your lips for the first two days after the treatment. Until the initial swelling and redness have resolved, do not expose the treated area to intense heat (e.g. in a sauna or by sunbathing) or extreme cold. What should I do prior to the treatments? Avoid taking aspirin, non-steroidal anti-inflammatory medications, St. John’s Wort and high doses of Vitamin E supplements one week prior to the procedure. This will help minimize any bruising or bleeding at the injection site. What other treatments are typically used along with Restylane? Quite frequently our patients will have Dysport or Botox injections to soften the dynaMIC wrinkles caused by movement such as frowning or squinting or lip pursing. Using both products simultaneously results in a smooth, relaxed and younger appearance. You’re getting a little older – your lips are thinning and flattening out. Those little vertical lines that used to only show up when you pursed your lips are now there ALL the time. What’s a gal to do? Loss of lip volume is inevitable. The little lines that come along with thinning lips generally are unavoidable too, and the deeper they become, the more difficult they are to deal with. Fillers – Thick vs Thin. How is this filler different from others? I’ve used regular Restylane before for my lips and it worked great. Why would I want Silk instead? Many people with lips that have adequate skin thickness can use Restylane or Perlane or Juvederm or Belotero. is with the patient who has delicately thin lip tissue and thinner skin. Absolutely, though, the tiny squiggly lines around any lips will be best treated with Restylane Silk. If you’ve tried other fillers for your thinning lips or not been satisfied with the outcomes from thicker fillers, then Restylane Silk is an excellent option. I’m still young, but my lips are thin and always have been. Can I use Restylane Silk? Bear in mind that lack of volume in the lips may be a genetic trait and you don’t have to be older to need volume. Restylane Silk is an option for any patient 21 or older. George will help you decide which gel formulation will work the best for you. How is Restylane Silk injected? We use a needle to place the product where it’s needed near the surface of the skin. Injections into the lip body and border can generally be placed with a smooth tip MICrocannula. Restylane Silk does contain lidocaine to make the injections more comfortable. Restylane® Lyft, initially approved by the FDA in Spring of 2007 under the name Perlane, is a “mid-dermal” hyaluronic acid filler product. As a sister product to Restylane, Lyft is designed for more pronounced facial folds and cheek and mid face volume restoration. The firm gel is injected into the deep dermis to add volume to help restore surface contour to approximate a younger-aged appearance. Restylane Lyft corrections maintain volume augmentation for about six to nine months before natural product degradation begins to lessen the effect. Both Restylane Lyft and Restylane are composed of hyaluronic acid. The primary difference between Restylane and Lyft is that the hyaluronic acid gel particles in Lyft are larger than those found in Restylane. This gives the filler additional ability to lift and fill the areas of injection that require a denser formulation to hold shape. Lyft and Restylane are perfect complements to one another. Restylane Lyft® is an injectable gel designed to lift folds and replace lost facial volume from fat loss, bone loss and collagen degradation. Lyft’s water-loving nature attracts and binds water molecules to help maintain volume. Restylane Lyft is composed of hyaluronic acid, a natural substance that already exists in the body. The hyaluronic acid in fillers is a crystal clear gel that is cheMICally cross-linked (the long cheMICal strands are tied together) to delay breakdown by skin enzymes. All Restylane products are non-animal-based and free from animal protein. This quality prevents disease transmission. Allergy pre-testing is not necessary. Also distinct from other hyaluronic acid dermal fillers, Restylane products are minimally cross-linked, making them similar to the natural hyaluronic acid found in the body. Also view the Restylane Lyft website.